Review: Go see it with the family, leave your brains at home, and have a good time! In 1996, Will Smith’s box office status as a superstar was cemented with Roland Emmerich’s epic sci-fi blockbuster Independence Day. At that point in time, audiences had not seen an alien invasion disaster movie quite like it, melding crazy action, humor, and patriotism all at once. It solidified what Americans thirsted for and wanted in an action movie, and it became a legendary part of the “best sci-fi movie” canon. After its wild success, it became a no brainer that the distributor, 20th Century Fox, wanted a sequel, but for that, the creators and cast agreed that a brilliant script topping the original had to be written in order for such a film to be made. Audiences waited…and waited…and waited. Some time ago, the creators finally cracked a script idea which they felt would do justice to continuing the franchise, but a major hiccup came into play. The leading man, Will Smith, would not be returning due to conflicts with the studio over salary issues. The creators trudged on and came up with a script removing Smith’s character but bringing everyone else whom we loved in the first film. 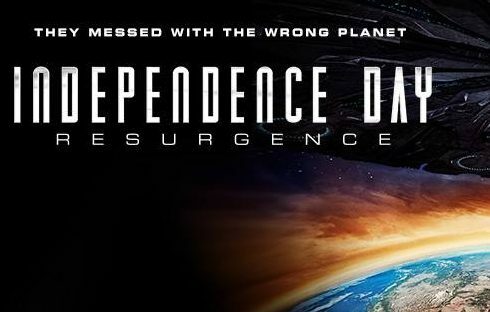 The result is the newly released Independence Day: Resurgence, which, although had audiences excited at its announcement, lent itself to the question: will this be good without Will Smith? Let’s find out. The film picks up exactly 20 years after its predecessor, and re-introduces Dr. David Levinson (Jeff Goldblum), Dylan Hiller (Jessie Usher, the character of Will Smith’s son from the original), President Whitmore (Bill Pullman), Patricia Whitmore (Maika Monroe, the President’s daughter from the original), Dr. Okun (Brent Spiner) and Julius Levinson (Judd Hirsch). We also get a new leading man in Jake Morrison (Liam Hemsworth). The plot is quite simple. Another alien spaceship, bigger and more dangerous than the first film, heads towards Earth to destroy it and it is up to our heroes to stop it. The performances are all top notch. Jeff Goldblum does what he does best, as a sarcastic scientist whose intelligence always saves the day. Jessie Usher and Liam Hemsworth fulfill their roles as the leading men quite ably, while Brent Spiner and Judd Hirsch bring the right doses of humor to the movie, which never goes overboard. Maika Monroe is excellent as Patricia Whitmore and Bill Pullman puts in a good performance, albeit brief one, as President Whitmore. Charlotte Gainsbourg plays the role well of a sophisticated scientist, while Sela Ward also makes a memorable cameo as the President of the United States. I give kudos to this movie for a few different reasons. One, it remains true to the spirit of the original. Lately, we have been seeing a trend of “dark” blockbuster movies, where our leading men are violent and angst ridden. Although that approach has also worked well in certain movies, it is nice to see one which has a lighter tone. There is no bloody violence, no one depicted in severe pain, no grey shades to any character. The good are the good and the bad are the bad. As a result, it is an excellent film for the family, where the kids will love the special effects and the adults will love the action set pieces. I am glad this spirit of the “family summer blockbuster” remains intact under Roland Emmerich’s direction. Another reason why this movie works is its pacing. There is not a dull moment, once the film gets going about half an hour in. The first 30 minutes focuses on character introductions, which is particularly necessary for newer audiences who have not seen the original. The action is relentless, with the climax being tremendously silly fun. For me, the key to any movie is the right pacing, and I am glad this film picked that up from start to finish. Third, I was so happy to see that this movie was respectful to women. We had a strong President in Sela Ward (whose final scene in the movie is quite memorable) and more so, the character of Patricia Whitmore played a major role in the movie. Not only did she have a role with substance, her participation in the action in the climax was a wonderful sight to see because, let’s be real, Hollywood has not been kind to our female leads in action blockbusters. Patricia’s character gets to join in on the action packed climax, and plays a major role in that part of the movie. Wonderful to see a forward thinking filmmaker like Emmerich, who has given equal justice to men and women’s parts in the film. A final plus of the movie: the spirit of an ensemble. Every character gets his/her moment in the movie, and no character overshadows another. There is no one lead, everyone is on the same plane. It’s a challenge to do that in a movie, but Emmerich handles that very well. As a result, quite frankly, Will Smith is not missed even once during the movie. Are there any negatives? Perhaps the only thing I could say is that the sequel does not do anything new for the franchise. It’s a familiar story, with a familiar ending. Only the effects, style of filmmaking, and scale have gotten bigger. I give this film a 7/10. Go see it with the family, leave your brains at home, and have a good time!